You can save up to 10% on your heating bill while lowering your carbon emissions by switching to one of our Premium heating oil products. Keep up to date with the market or our latest offers by signing up for our newsletter. We don't pass on your details or bombard you with emails. Follow these hints & tips to improve the efficiency of your system and save on your fuel bills. What can WCF Fuels North West do for you? WCF Fuels North West are a long established, independent fuel supplier in the Lancashire and South Cumbria area founded in 1911. From our main depot at Carnforth and other satellite depots we are able to supply quality kerosene heating oil and diesel to domestic homes as well as agricultural and commercial businesses. 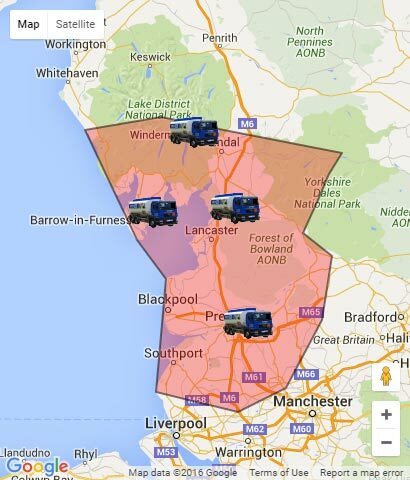 Our delivery area covers Barrow to Millom, Ambleside to Kirkby Lonsdale, Kendal to Hawes and down to Burnley, Blackburn and Preston and all in between. Our fleet of modern tankers are ideally situated to reach you quickly and efficiently. Our staff are some of the most enthusiastic in the fuels business with many decades of experience between them and one common goal; customer satisfaction. Our staff always strive to ensure that ordering your next delivery of fuel oil is quick, easy and hassle free whilst providing a first class, personalised service. So whether you need kerosene heating oil, premium heating oil, red diesel or Derv, WCF Fuels can help.